SMART Marketing available on Amazon! Hey, I thought I’d just let you know that my books, SMART Marketing, and The SMART Marketing Workbook, are available on Amazon. The publishers have let me know that overall, sales have gone over 1,000! If you haven’t got it yet, get over to Amazon and get yourself a copy of both books, they will revolutionise how you market your small business. SMART Marketing is written as a novella, a story of how a husband & wife small business discovered that they could develop their own marketing plan and focused marketing strategies by following 7 simple steps. Business is highly competitive these days, whether you sell on the web or in a bricks and mortar store. You need an edge. You need to specifically target those customers who are set up to buy from you, who (unknown to themselves) already need your product. The SMART Marketing methodology has been compiled from my 35 years in advising small businesses how to cut through the garbage and get to the centre of the message and grow their sales. This is experience married to practical methodology that cannot fail! What’s in it for YOU? You will learn how, in 7 easy to follow steps, you too can transform the sales and marketing of your business. You will see how to understand the benefits of your products that the customers want, you will see which customers you are wasting your time on and which customers you need to target for easily achievable sales. You will learn how to prioritise your marketing activities so that you get the BIGGEST bang for your buck. All my clients have benefitted from this methodology – why don’t you? Once you have read SMART Marketing, you can start straight away and follow the step by step methodology detailed in the book. 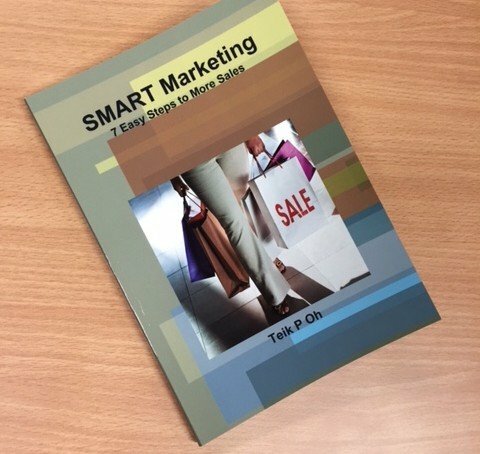 However, if you want guidance on how to implement each phase towards getting more focused marketing and attracting the right customer already set up to buy, get The SMART Marketing Workbook, which lays out the methodology in step by step workshop format. It’s as if I were in front of you facilitating each and every question. The Workbook is complete with templates that start by capturing your product information, and then funnel it through a series of filters to arrive at your focused marketing strategies and action plans. Click here to go to Amazon and buy your copy now! If you enjoyed the books, I ask you to leave a review on Amazon! Help me spread the word about how easy it is to set up your own business for sales growth and business success! Does my small business really need a Board?